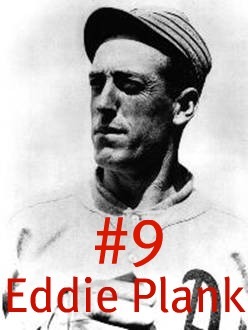 Eddie Plank is the best Philadelphia athlete you’ve never heard of. Yeah, some guys beat him as more underrated, but you’ve heard of those guys. Odds are you’ve never heard of the former A’s great (I had never heard of him until I did that piece on the 1911 World Series), which is nuts because he’s one of the greatest left handed pitchers in the history of baseball and the argument could be made that he’s the greatest lefty in the history of Philadelphia baseball. I know. I know. Blasphemy, right? Well, not so fast. Carlton won 329 games. Plank won 326. Carlton had an ERA of 3.22. Plank had an ERA of 2.35. Plank’s career WHIP was 1.119. Lefty’s was 1.247. The only place where they don’t compare is strikeouts. Lefty fanned 4,136 to Plank’s 2,236. I think the slight edge overall goes to Carlton, but not by much. And the fact that it’s even up for debate shows you exactly how good Plank was. Born in Gettysburg, PA, in 1875, Plank was known as Gettysburg Eddie. He made his debut with the A’s in 1901 at the age of 25, and he would stay with them until 1914. He helped them to World Series wins in 1911 and 1913. He still holds the record for most shutouts by a left-handed pitcher, with 69. All Gettysburg Eddie did was win baseball games. A lot of them. He may have been forgotten in Philly, but not in his hometown. He is a Philadelphia athlete you absolutely, positively should know about.